← Convert px3 to pdf and set page size via command line? 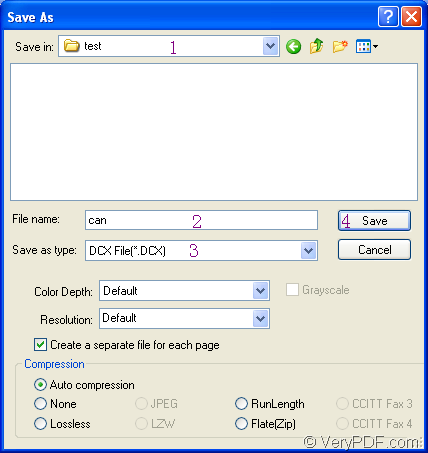 DCX format file is the index used by a FoxPro database, which improves the efficiency of searching and sorting items in the database. 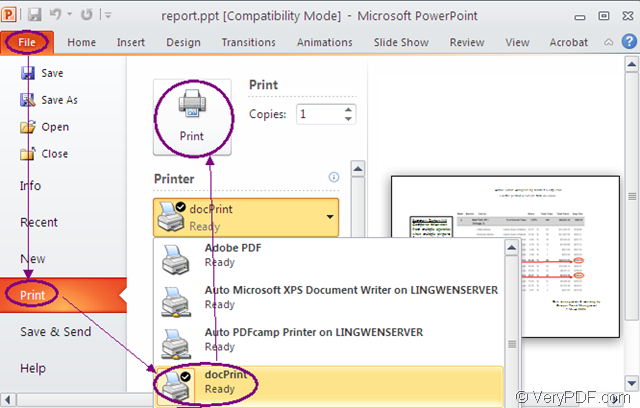 If you want to convert the document of ppt to dcx format file, please take docPrint Pro as your assistant. Let’s get the acquaintance to docPrint Pro together first. docPrint Pro is short for docPrint Document Converter Professional which can convert MS Office 97/2000/XP/2003/2007, WordPerfect, AutoCAD DWG, PostScript, Adobe Acrobat PDF and many other document types to Adobe Acrobat PDF, PostScript, EPS, XPS, PCL, JPEG, TIFF, PNG, PCX, EMF, WMF, GIF, TGA, PIC, PCD and BMP etc formats. 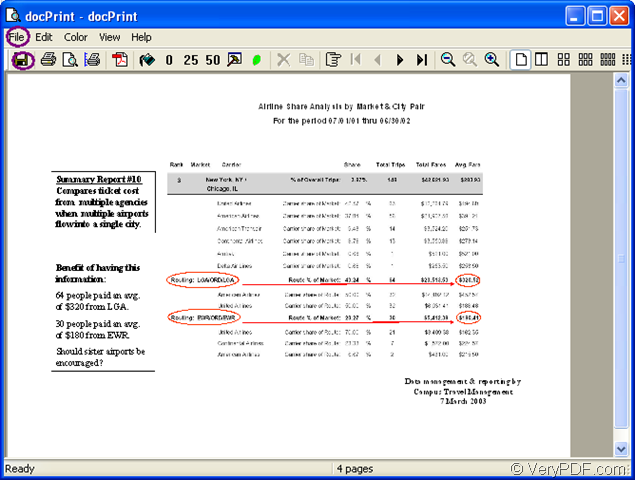 docPrint Pro works in GUI version, Command Line version and virtual printer version. As one application of docPrint Pro, the virtual printer docPrint is the leading role in this article. It plays not only a printer, but also a document converter which can realize many powerful functions. To use docPrint, you should download docPrint Pro first at http://www.verypdf.com/artprint/docprint_pro_setup.exe and install it on the disk of your computer. You can see the printer in printer list by clicking “Start”—“Printers and Faxes” after the installation. Three steps are required to convert ppt to dcx. 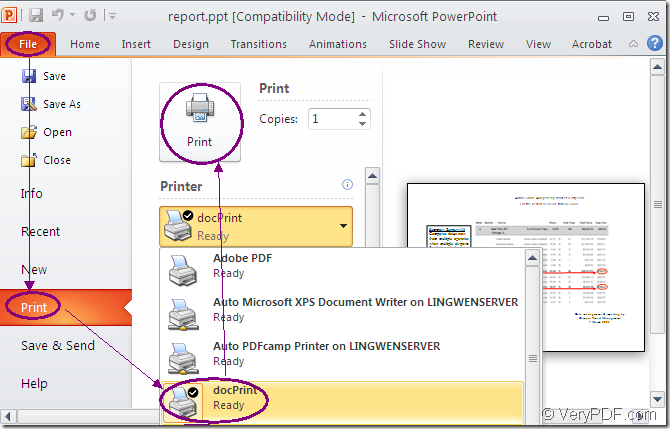 In an opened PPT document, please click “File” and click “Print” to open a new dialog box, in which you can choose the current printer as docPrint, please see Figure1. Then click “Print” button to run docPrint. You can also use the hot key “Ctrl”+ “P” to open the same dialog box. If you have set docPrint as the default printer, please right click the PPT document icon and choose “Print” option in dropdown list, which can skip the dialog box mentioned above. In popup “docPrint” dialog box showed in Figure2, you should use the following three ways to open “Save As” dialog box. Click the icon which is framed in the ellipse in the toolbar. Use the hot key “Ctrl”+ “S” to open the dialog box. 3. Save the target file. Before run the conversion from ppt to dcx, there are several steps to be completed in “Save As” dialog box showed in Figure3. In “Save in” combo box, please specify the path for the output DCX file. In “File name” edit box, you can input the name for output file. Please choose the output format in “Save as type” combo box. The conversion will run itself and it will take only several seconds. After that, you can browse the output file in specified location. The whole conversion is simply easy and you can do it perfectly. 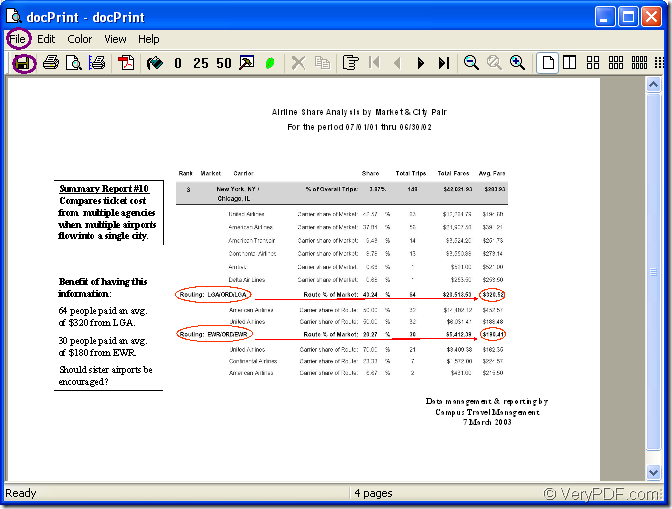 To obtain more information about docPrint or docPrint Pro, please click the link http://www.verypdf.com/artprint/index.html. How to convert files of AutoCAD to pbm? This entry was posted in docPrint Pro and tagged docPrint Pro, ppt to dcx. Bookmark the permalink.